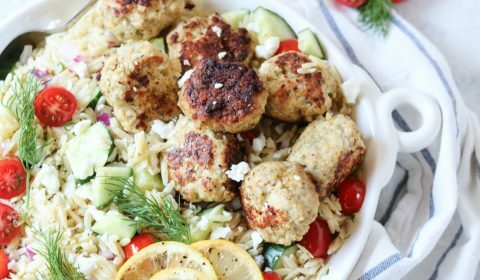 A fresh summer pasta salad option with a bonus addition of chicken gyro meatballs! How many of you (most likely hailing from the Midwest) grew up on pasta salad with Italian salad dressing? I know it was a staple at every summer BBQ I ever attended. Then I met my husband who’s from Pennsylvania, and they have their own version with added in cubes of cheddar cheese and mini-pepperonis. Sound familiar? 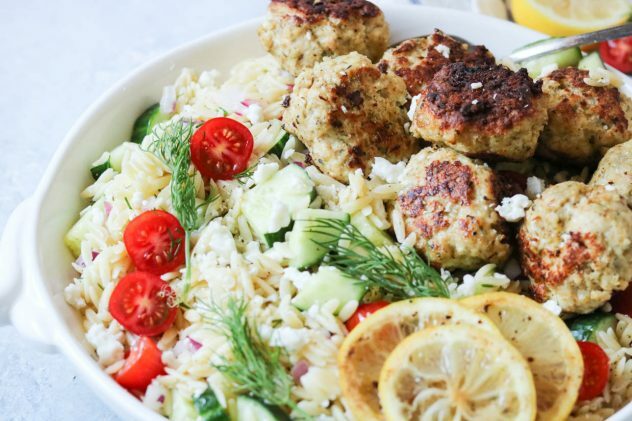 This greek orzo salad with chicken gyro meatballs is a fresh makeover on that been-there-done-that traditional pasta salad recipe. Orzo has quickly become my new favorite pasta. I’m not sure why exactly, but it just is. It’s small and easy to eat, much like rice. The traditional pasta salads I’ve had in the past usually use angel hair or spiral pasta. Try giving orzo a try and let me know how you like it. I actually like some protein with my pasta salad, so that’s why I decided to add in my chicken gyro meatball recipe. They take this greek orzo salad from a side dish to an actual meal, if you’d like. I also kept the oil dressing in this salad to a minimum; just using olive oil, fresh lemon juice, and fresh dill. It keeps this salad on the lighter side so it’s not weighed down by heavy oil-based salad dressings like traditional Italian dressing. You can also add in any extra veggies you’d like, like olives, peppers, etc. Make it your own! 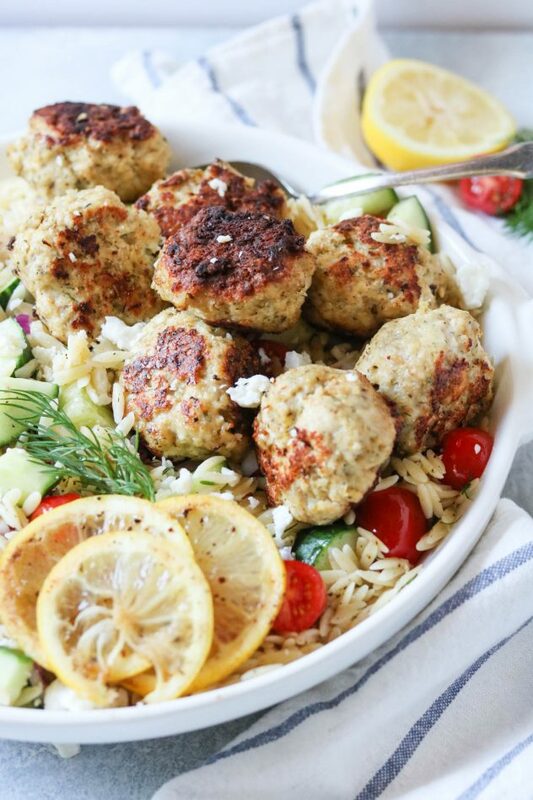 Greek orzo salad with chicken gyro meatballs. In a mixing bowl, combine the chicken gyro meatball ingredients (ground chicken, egg, breadcrumbs, lemon juice, and spices.) Mix together until well-combined. 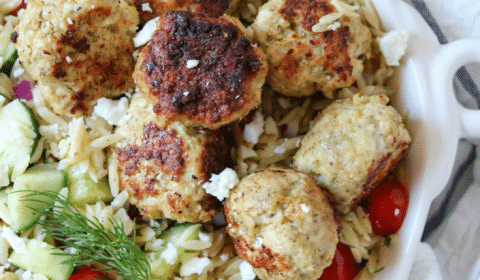 Form chicken gyro meatball mixture into small round balls, and add to a skillet. Cook over medium-high heat, turning frequently until thoroughly cooked. In a large saucepan, cook the orzo pasta according to package directions. Drain and transfer to a large mixing bowl. Add the chopped cucumber, red onion, tomatoes, fresh dill, lemon juice, olive oil, salt, and pepper. Stir to combine. Transfer the orzo mixture to a serving bowl. 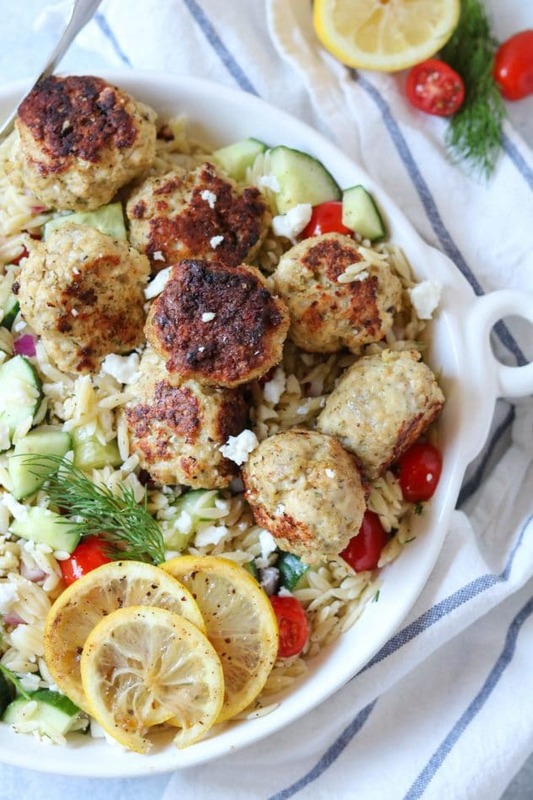 Top with crumbled feta cheese, chicken gyro meatballs, and serve.